The book, “Joe DiMaggio and the Last Magic Number in Sports,” written by Kostya Kennedy takes you through a day by day account of Joe DiMaggio’s 56-game hitting streak in 1941. Many baseball people believe this streak will never be duplicated. It should be noted that 1941 was also the last year a player ended a season with over a .400 batting average when Ted Williams batted .406. 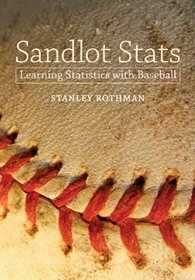 In Chapter 16 of my book, “Sandlot Stats: Learning Statistics with Baseball,” I develop a new formula which uses a player’s seasonal batting statistics to assign a probability of that player duplicating any batting streak. Then I apply my formula to calculate which players had the highest probabilities of duplicating special batting streaks. Of course, the most talked about batting streak is DiMaggio’s 56-game hitting streak. Another interesting streak belongs to Ted Williams when in 1949 he reached base successfully in 84 straight games. Which streak was harder to achieve? My formula assigned DiMaggio a probability of .0001 (1/10,000) and assigned Williams a probability of .0935 (935/10,000) of achieving their respective streaks. This says that, using their batting statistics for 1941 and 1949, for every 10,000 seasons DiMaggio would duplicate his streak one time while Williams in 10,000 seasons would duplicate his streak 935 times. Clearly DiMaggio’s streak was the harder to achieve. I also apply my formula to many other batting streaks such as the most consecutive games with at least one home run, the most consecutive games with at least one extra base hit, the most consecutive games with at least two or more hits, the most consecutive games without striking out and many other streaks. If you are interested in seeing the mathematics I used to develop my formula and the players who actually own these records, please read Chapter 16—titled ‘Streaking’— in my book. A discussion of DiMaggio’s 56-game hitting streak always resurfaces whenever a player starts approaching DiMaggio’s record. The Cleveland Indians 20-year old catcher Francisco Mejia, ranked their number four prospect, playing for the High-A Lynchburg Hillcats entered August batting .344. On Aug.4, he extended his hitting to 45 games by doubling in the 9th inning after going 0-4. As of this writing his hitting streak stands at 47 games. This ranks his streak as the 7th longest in Minor League history. 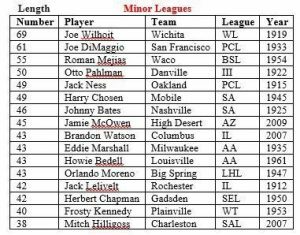 Below are the players with the longest hitting streak in both the Major and Minor Leagues. There are many observations that can be made from these two tables. DiMaggio is the only player that appears on both lists. In fact, his 61-game streak in the Minors was longer than his 56-game streak in the Majors. Yes, Joe D. was a very special player. Except for Joe the other players listed in the Minor League Table had limited Major League success. In contrast, the Major League players listed are all Hall of Fame caliber players. What conclusions can you draw from this?